My career as a horse trainer took a sudden detour back in 2008, when I went from riding horses for a living to producing a television series, called Horse Master with Julie Goodnight. Becoming an Executive Producer and Host of a TV series was not in the original business plan, when I started my horse training company back in 1987. But when a door opens, I tend to lunge for it. I had no idea where this door would take me, but I am sure glad I went through it, because that door took me on an incredible ride. Now, 11 years and 260 episodes later, I can honestly say that the job we started out to do is complete and it’s time for me to move onto something bigger and better. Knowing that every project has a beginning and an ending, and that no TV series can run forever, it was important to me to bring the series to close while we were still on top with the fans and doing our best work. Even though we’ve produced the last episode of Horse Master, this significant body of work will live on for decades and will still be available to viewers around the world. Back in 2007, RFD-TV was a fledgling satellite network offering TV programming to rural areas, including horse programs. It was really the start of weekly horse training programs that could be seen on TV. I was offered a contract with the network, who would air the shows if we produced them. It was an incredible opportunity—the only catch was that we had just three months before the first shows would start airing. I had no crew, no cameras, no sponsors, no locations, no cast members and twenty half-hour episodes to produce. Knowing I couldn’t do it alone (I may have been a good hand with horses, but I knew nothing about producing a TV show), I recruited Heidi Melocco (then Heidi Nyland) to jump off the cliff with me. Heidi came onboard as Producer and Director, helping create the production and sticking with the show for ten years and 236 episodes. Without Heidi’s help, I would never have been able to pull this off. Little did we know then, that the series would go on for so long and become an award-winning, substantial body of work. So we jumped off the deep end, took the deal offered and scrambled to get a crew together, find a shoot location plus the horses and people we needed to be on the show. Within a few weeks we pulled a shoot together in Longmont, Colorado, calling on many of our friends to be on the show. Looking back on it now, with 260 episodes behind us, I am amazed at how well we did at that first shoot. I recall staying up all night, trying to compose what I would say and practicing a difficult line that I needed to say at the close of one of the shows, without breaking into tears (S1: E3). One of my funniest memories of all the Horse Master shoots, was from that first location. I had no idea what clothing I should wear, so I basically threw my entire equestrian wardrobe in suitcases, which ended up dumped on a filthy tack room floor (in my unglamorous, not-so-private dressing room) so we could rummage through them to find the right outfits. I must have changed clothes 100 times at that shoot. Special credit goes to my friend and wardrobe wrangler, Cheryl Lee (S6: E6 and S9: E2), whose style help we enlisted from the beginning of the series and who stuck with me to the very end (and still counting). It’s not an easy job to style-up a horse trainer. At the very first shoot for Horse Master, we taped 6 episodes in 5 days. As the years went by and we all got better at our jobs, we were shooting 8 episodes in 4 days. 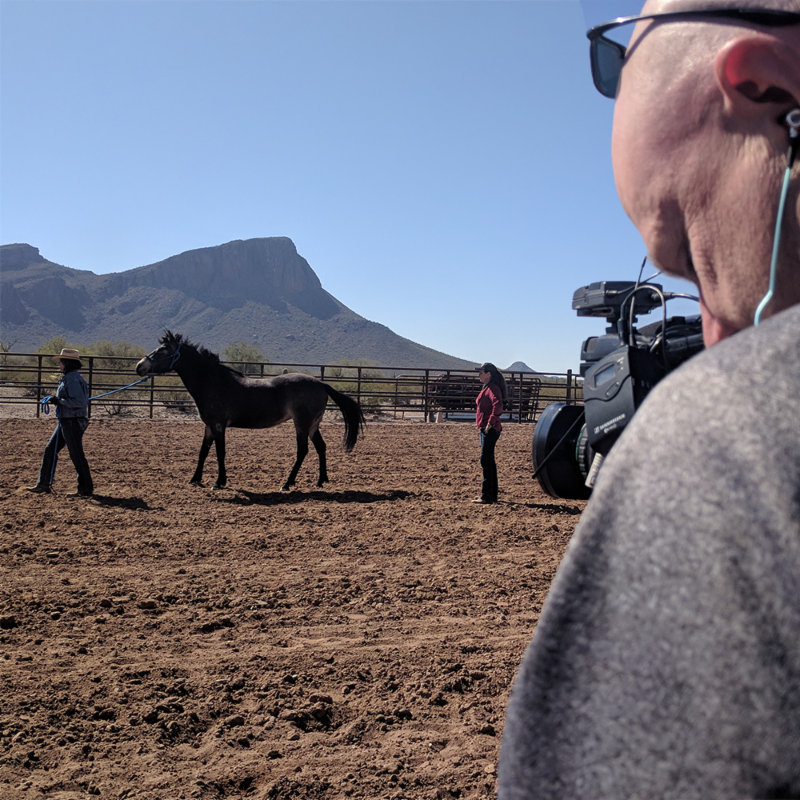 We learned a lot about TV production over the years, about working with horses in live-action (horses don’t do re-takes) and about finding the people and stories that would make the show interesting. From 2008 through 2018, we produced a massive amount of content about horse training and horse people. Our original concept for the show was that it would feature a new horse and rider every week, helping them overcome challenges and reach new goals. Knowing that in the TV world, they describe new shows by comparing them to current shows, back in 2007, when we were first pitching the show, we liked to say that Horse Master was a cross between Dog Whisperer and Super Nanny. We produced 260 episodes over 11 years, at 37 different shoots, in ten states, and at 18 different locations. We shot in Colorado ten times, in Arizona nine times, five shoots in Florida, three in California, two times in South Carolina, Texas and Massachusetts, and once in Georgia and Tennessee. We shot at my ranch in Salida, Colorado, every summer and we ended up going to the White Stallion Ranch in Tucson for seven shoots, because it served our needs so well for winter shoots and because the scenery and accommodations were fantastic. To this day, many people think I live in Arizona. Once we set a location and dates for the shoot, we would begin to recruit people and horses for the show. They would fill out an application online and about a month before the shoot, Heidi and I would comb through the applications, trying to find the right mix of horses, people, riding disciplines and problems to solve. It turns out, this was one of the hardest parts of producing the show, and we got pretty good at it, although we always dreaded it. We hated that we couldn’t take every horse on the show. Looking back on all 260 episodes, there are some cast members (both two-legged and four) that I will never forget. I can remember every horse I worked with and each one of them had something to teach us. I compiled some statistics about Horse Master, which are not only interesting facts about the show, but also reflect the American horse world—the people and horses, and the challenges they face. 115 episodes of Horse Master featured Quarter Horses (both purebreds and grade). That should come as no surprise, since they are by far the largest breed of horses. We also featured 24 Paint horses, 20 Thoroughbreds, 19 Warmbloods (of various persuasions) and 16 Arabians (purebreds and crosses). Again, very representative of the American horse population. Interestingly, eighteen of the horses we featured were Palomino in color. I’ve always thought Palominos liked to be the center of attention and this statistic bears that out. Ten gaited horses starred in Horse Master, eight pony breeds were represented, six Mustangs, six Morgans, five Appaloosas, three Paso Finos and one Peruvian Paso, and two mules were also featured in episodes. Through all eleven years of production, we tried to have a balance of people, riding disciplines and subjects. But to be honest, getting men on the show was always a challenge. Every man that applied, got on the show, but sometimes it turned out that his wife had filled out the application, unbeknownst to the husband. Same thing happened with kids—they would apply to be on the show without their parent’s knowledge, so we learned to follow-up on these things. All said and done, our cast members included 28 youth, 24 male and 208 female equestrians. In preparation for this article, I went through our catalog of episodes several times. I can honestly say, I remember every horse we had on the show, but some stand out more than others in my mind. Looking at all 260 episodes, there were about 27 shows that really stood out to me—either because we made a big impact or because I learned something important. I’ve written about all 27 of these episodes in a separate article, but of those memorable episodes, a couple are indelibly imprinted on me. S4: E9, “Bucket List” This was an incredible episode because this beautiful black QH mare, who was the apple of her owner’s eye, had a huge breakthrough in her training—going from a high-headed, fast and choppy ride, to a rounded, soft frame and slow, rhythmic gaits. Truly becoming her dream horse. It wasn’t easy to get there- a significant bit change and a lot of training on my part. By the time the sun was setting that night, the mare was perfect. Of all the episodes, there was never a person on Horse Master more thrilled with the outcome, than Cynthia. We were all shocked and saddened to hear that her dream horse died of colic, just a few short weeks later, long before the episode was edited (making it more bitter sweet). A tragic reminder to us all, that horses are delicate creatures and we should treasure our time spent with them and the gifts they give us. S11: E7-9, “The Lost Episode of Chief” I will never forget this horse; he starred in three episodes in season 11. Memorable in part, because he belonged to my good friend and neighbor, Amy, but also because of his crazy history (he was dumped at a horse rescue after being gored by a bull) and because of his strong sense of right and wrong and his regal bearing. He was extremely intolerant of any mistakes and would become aggressive if he thought you did something wrong, thoroughly intimidating his owner. He was a very big Morgan— dominant and powerful, especially when he was charging you head on, with ears back, teeth barred and ‘smoke coming out his nose’! Amy was determined to become a better leader to her horse, and that she did. He was a tough nut to crack, but she won him over in the end. It was an interesting and intricate relationship that evolved, requiring Amy to step up and Chief to step down. We only half-jokingly changed his name to Cobb, as Amy came to realize that she could not buy this horse’s admiration with love and pampering, but she could earn it by becoming a better leader. I’m very proud of the body of work we’ve amassed with Horse Master, on horse behavior, training and riding horses. This content is “evergreen,” meaning it will not become outdated or obsolete any time soon. All 260 episodes of Horse Master are available online (SVOD) and searchable by key words. So, if a horse owner in say, Dubai, were to search the content for “bucks at canter,” six different episodes would come up and hopefully one of them would answer his question. Horse Master Online is available by subscription at TV.juliegoodnight.com. Horse Master is also enjoying its first run internationally, with season 11 currently playing on Horse & Country TV in UK, Ireland, Netherlands, Sweden, Germany, Austria, Australia and Canada. We are working with other content providers to dub Horse Master into Spanish and Portuguese, for airing in Spain and South America. All over the world, there are places where horses are deeply entrenched in the culture, and the content providers want Horse Master. Who knows? Maybe we’ll resurrect the show in another country… Horse Master: South Africa… Horse Master: Brazil… Horse Master: Ireland…. Most folks that know me, know that I am not one to sit still for long. Or at all. In fact, for the last two years, my partner and producer, Stephen Schott and I have been burning the candle at both ends– creating a brand-new TV series at the same time we were completing Horse Master. We launched a new company, 2Horse Productions™ (same players, new name and a few new partners), and began production on a new series called, Horse Life with Julie Goodnight. Horse Life is an unscripted lifestyle series featuring people and places where horses are entrenched in the culture. Horse Life goes behind the scenes into the splendor and nature surrounding horse communities around the world. Host Julie Goodnight (that’s me) brings expert insight to illuminate the unique cultures, history, and the magical world of horses and the lives of equestrians. You’ll be hearing a lot more about this new series soon! We’re very excited about the opportunities before us and we are hard at work, producing the new series. Producing 260 episodes of a TV show is no small undertaking, by anyone’s standards, and I could never have pulled it off without lots of expert and enthusiastic help from others. I have an abundance of gratitude for all the horses, people and places that were part of Horse Master over the years. It would take pages and pages for me to thank them all, but there are some individuals that were indispensable to the production, whom I wish to acknowledge. A big thank you to Heidi Melocco, Producer and Director, who was willing to take a chance with me and jump into the TV world with both feet running. To Stephen Schott, Producer, Director, Camera and Editor; often the only male on our shoots, Steve put up with a lot! His patience, work ethic and vision have been invaluable to me. To Rich Moorhead, 2nd camera and supportive husband, willing to jump in and take on any job and whose business acumen I rely on heavily. To Cheryl Lee, my dear friend, wardrobe wrangler and style advisor for all 11 years and 260 episodes (trust me, I am not an easy person to style up!). To Lucy Achenbach, Tanya Cody and Twyla Walker-Collins, all of whom appeared int eh show throughout the eleven years, for their excellent help as assistant trainers, helping the horses and patiently working with cast members behind the scenes (the latter more challenging). 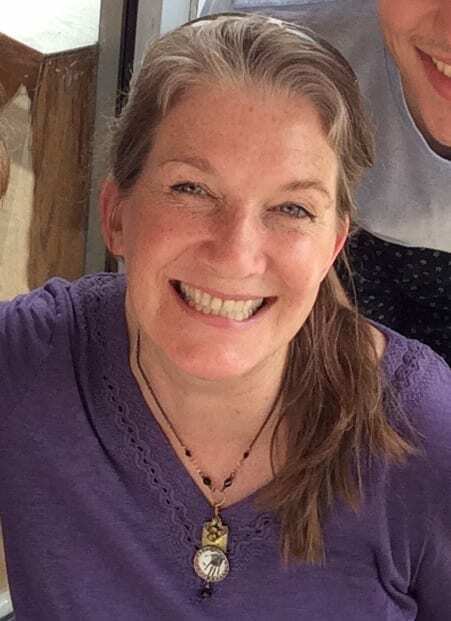 To Susie Donaldson, key grip and editor’s assistant, who has a keen eye for details and who was always looking for ways to make the show better. And Jackie Marks, key grip on many shoots—thank you for keeping everyone calm and on-track. Thank you to my dear friend, Sharon Gilbert (S1: E3), key grip, on-set guidance counselor to everyone and someone’s who’s insight I always value. Gratitude to my invaluable Salida staff who always keeps my wheels turning—Twyla Walker-Collins (S11: E7-9) Megan Fischer, Diana Hatfield and Melissa Arnold (S4: E6). They’ve contributed a lot to the series over the years, and they come to work every day with smiles on their faces, eager to help with whatever crazy project I concoct. To Brenda Beach, Shawntel Gallegos-Wilson, Alisa Reniker, Mary Ann Page, Madison DeCook, Lucy Koehler, Dawn Hurlbert, Carolyn Nyland, Sddita Blackburn, Pi Poletta, Bill Bekkering, Gwen Van Dorp, Rosie Sweatt, Dawn Roberge, Tami and Eddie Leedy, Debbie and Mark Gould. Thank you all for being excellent grips and for giving us your time and energy on multiple shoots. There were many local volunteers, too numerous to mention here, whose help on shoots we were grateful for and who appear in the credits. You are not forgotten! Without the 260 brave souls who appeared on the show as cast members and brought their horses to me, we would never have had such an interesting show. Thank you for your courage to apply and your willingness to give us two days of your life. I hope you and your horse remember your time on Horse Master fondly and that you continue to pursue your dreams. The names of our cast members, two- and four-legged, appear in the show and in the credits, so we will always remember you! A special shout out goes to Myler Bits and Toklat Originals, our presenting sponsors and two companies I love partnering with because they understand importance of educating horse owners, to help horses. Dale Myler, world-renowned expert on bits, contributed to many shows and taught us a lot, starring in two episodes each year from 2011 to 2018 and helping us with many other episodes. Anyone who watches the entire series knows that through the years I changed the bits on many, many horses. We changed bits so often that sometimes we didn’t we forgot to mention it. All three of the Myler brothers have dedicated their lives to making bits better for horses, and you can witness the profound impact this has on horses in many of the Horse Master episodes. Thank you to Toklat for supporting our production and for supplying bits to the horses that needed them. Troxel Helmets also supported the show and its mission to promote safe riding practices and make helmet-wearing cool, by donating beautiful and sporty equestrian helmets to all the cast members and me. That was a lot of helmets over past 11 years. 326 of them, to be exact! Riders everywhere (and their friends and families) thank you. I am also happy to report that other than a few nips and kicks here and there, we never had any serious injuries to horses or people during 37 shoots, over 11 years. Thank you to ALL the cast and crew for keeping your focus on safety. We recorded Horse Master in some incredibly scenic locations, from Martha’s Vineyard (S2) to the Napa Valley (S3). All the locations were amazing and welcoming, but some places were so perfect that we went back, again and again. A special thanks to the White Stallion Ranch, Tucson AZ, and the True Family. It’s an incredible guest ranch in the Sonoran Desert, with huge Saguaro cacti looming in the background (and the only place we could reliably shoot in the middle of winter). They were so good to us that we shot there seven times (S5-11)! I’d also like to thank the Grand Oaks Equestrian Resort in Weirsdale FL, for their scenic location, exceptional facilities, fabulous accommodations and gracious hospitality (S1, 10, 11). We might have shot there one more time, if not for the hurricane! And finally, I’d like to thank all the horses, Seasons one through eleven and Episodes 1-260—without them, there would have been no show. They never volunteered to be on the show, but we treated them like stars anyway. We learned a lot from every one of the horses and they did their best to make us better people. In turn, we did our best to help every horse that we could, by teaching their people something. Horse Master always was, and continues to be, all about helping horses, one human at a time. Sad to see the show come to an end. I will enjoy re-watching episodes on the website and RFD-TV. Julie, you have taught me so much over the years. I feel like we are old friends. You are one of my heroes and mentors. I am excited for your new series and look forward to watching it. It is my hope to attend a clinic someday, hopefully at C Lazy U. Best wishes for your new endeavors. I know you are going to be amazing! Congratulations Julie and all. I loved reading all of these details related to producing the show. You made it look effortless and who knew how many people it took and how much staff it takes behind the scenes! Fortunately for all of us, the content remains available through your website. I have gone back to articles and shows multiple times and will continue to do so. Really enjoyed your show. Learned a lot over the years. I will miss it! Julie, I will follow you whatever you come up with next! You give hope to us aging equestrians everywhere! Thank you ! OMG…. this has me in tears! I am eternally grateful to have discovered Julie shortly after adopting my Paso rescue- without her, he literally would not be alive today. I had given up on being able to “control” (hah) him, and was considering putting him down. After a Julie clinic, I had renewed hope, and became a library member and YouTube follower to learn more. Metro and I were privileged to be chosen for Horsemaster, and that brought us further along. I so look forward to the new show, and will always respect and love my now- friends Julie and her amazing team! Excited for the new show! Thank you for all the years you gave us on this show!